I have never really cared about Toronto FC despite the red hordes that I pass by frequently on gameday, or friends who have been dedicated fans since the franchise's inception in 2005. I mean, TFC are part of the MLS, that weird league of European football's pensioners and middling North American talent, right? I write, then, from a place of profound ignorance when it comes to TFC (and the MLS); as someone who has voluntarily remained on the margins of the club's success and failures, even as they unfolded in a city in which I work and live. My interest was only piqued when pint-sized Sebastian Giovinco came to find redemption in Toronto two years ago. It wasn't enough for me to follow or watch the team regularly, but it was enough to at least keep an eye on the scores--and Giovinco's ascent in the league. Through the lens of Italian football I have come to see TFC. It is a lens that at once distorts and provides acute clarity. It is the only lens that I have. Today, I will be cheering on for Giovinco as TFC take on the Seattle Sounders in a repeat of last year's MLS Cup Final. I care about the civic implications of a potential TFC win, what it would mean to this city if one of its franchises was to deliver silverware. I want to see the subway clogged; I want to see TFC take revenge for last year's defeat to the Sounders, so that Toronto's sporting self-esteem can finally brim and then spill out onto major intersections in the form of celebrations. But above all, I want to see Giovinco, a man who enjoyed only flickers of success in Italian football, achieve what would be the pinnacle of his career. I want to see a virtuoso performance that will cancel bittersweet memories of his days at Juventus or Empoli. The city deserves it, but so does he. Giovinco's compatriots Alessandro Nesta and Andrea Pirlo came to the league decorated and satisfied. 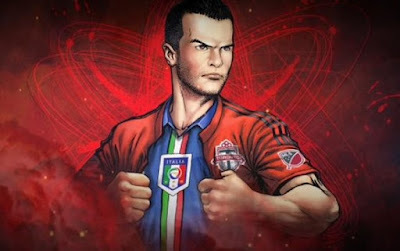 Giovinco came to the MLS at the peak of his powers--finite in Serie A, but infinite in the MLS. The Italian or Portuguese enclaves of this city only rejoice over football after a World Cup or European Cup win. TFC would provide another footballing excuse to block traffic, to unite behind a player who left the demands of a strenuous league to breathe more freely. At some level it matters little whether the MLS can be considered a demanding or competitive league. What matters is that it's evolving, and that away from the peculiar demands of European football it can allow players like Giovinco to play in front of raucous crowds and ignite debate of whether he should be included in the Italian national team. Giovinco has already won a lot; now he needs to take that final step.